Topaz representatives among this year’s pilgrimage participants. 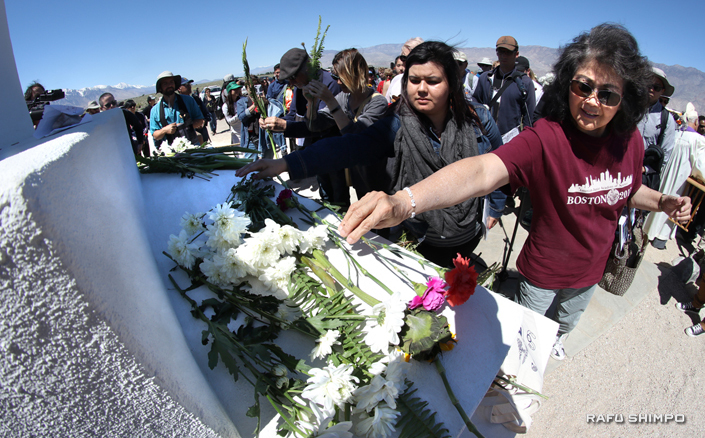 Following is Part 2 of our coverage of the 48th annual Manzanar Pilgrimage, held April 29 at the Manzanar National Historic Site in Inyo County. Over the years, Manzanar has garnered several national awards. Just last year, Manzanar was recognized with the Organization of American Historians’ 2016 Stanton-Horton Award for Excellence in National Park Service History. In addition, two volunteers, Saburo and Ann Sasaki, were honored with the National Park Service’s Hartzog Enduring Service Award for their volunteer contributions to Manzanar. This year, Jeff Burton, Cultural Resources Division chief, was recognized with the Society for American Archaeology’s Award for Excellence in Cultural Resource Management, a prestigious award that is rarely given to a government archaeologist. Mary Farrell, Burton’s wife and former archaeologist with the U.S. Forest Service, described the award as “timely” and like Johnson, felt the award elevated the profile of Manzanar. “We were really pleased that he got this, not so much for him, but for archeology and Manzanar and for the other sites too,” said Farrell. The archaeological digs at Manzanar have also been able to incorporate public participation by non-archaeologists. Cherston Lyon, associate professor of history at CSU San Bernardino, has been bringing a group of students from the History Club to participate in the archaeological dig for the past five years. Lyons said she started the program after Burton allowed her children to assist the rangers during a visit to Manzanar. Since then, the CSUSB students have made it a tradition to come over spring break. Madelon Arai Yamamoto was grateful to Burton and the staff for uncovering the fish pond that her father, Jack Hanshiro Arai, and his friends had built. Initially, the pond had been covered over with sand and no remnant remained visible. Since the uncovering in 2011, Arai Yamamoto donated funds so there is now a sprinkler system, five newly planted apple trees and grass. She said during the war, the pond also had carp, perch and minnows that her father would bring over while permitted to work out in the Inyo range, but the current pond will not include fish. Participants in Manzanar At Dusk gather at Lone Pine High School. More than 500 people participated in the Manzanar At Dusk, which was coordinated by students from CSU Long Beach, UCLA, UC San Diego, and California State Polytechnic University, Pomona. Juli Yoshinaga, granddaughter of Rafu columnist George “Horse” Yoshinaga, represented the students as this year’s Inter-Nikkei Collegiate Council president. She first came to Manzanar two years ago. “I was moved by the beautiful landscape of Manzanar but shaken by the scars that it caused our community,” said Yoshinaga. “Visiting Manzanar vastly expanded my knowledge on the reality of the incarceration camps and the unjust treatment that people went through. This year, there was a bus from the Fellowship Monrovia Church. John Williams, the director for the Fellowship Center of Racial Reconciliation for the church, said they have been focusing on the Asian American experience at their church and have had Chinese American and Korean American leaders come to speak. “We do different cultural events to help our congregation learn more about each other and so our biggest focus is on teaching each other how to have conversations with each other and how to be reconciled,” said Williams. Among the Manzanar Pilgrimage participants, there were three — Stan and Christine Asoo Umeda and Marielle Tsukamoto — who had just returned from a Topaz (Central Utah) Pilgrimage. “We got a day and a half of rest and came down with the Florin bus,” said Stan Umeda. The April 19 issue of The Rafu noted that this Topaz contingent was planning to return a sealed crate to Topaz that had been passed down to Toru Saito and hadn’t been opened for 72 years. At the newly built Topaz Museum, Saito and Kiyoshi Ina opened the crate at a ceremony attended by about 100 people, including the town mayor. What came out was a floral-patterned mattress. On this trip, the Umedas also returned a box to Topaz that had been in storage for the Watanabe family, from Stan’s maternal side. He and his family had been imprisoned at Jerome in Arkansas and Gila River in Arizona. The Umedas, however, threw the blankets away due to mold and donated just the crate. They also donated two archival boxes of Topaz newspapers and personal papers. While the Umedas admitted they were tired, they were glad they attended the Manzanar Pilgrimage. Included in this year’s pilgrimage was a traveling exhibit on Tuna Canyon, on display in Block 14. Kanji Sahara, one of the exhibit organizers, said they’ve had successful showing at the San Fernando Valley Japanese American Community Center, San Diego History Center, and Japanese American National Museum in Los Angeles. “I think we’ve had a good reception,” said Sahara, who noted that the exhibit is slated to be shown next in Santa Barbara, at CSU Fullerton and at the Portland Nikkei Legacy Center. Floral offerings are made to Manzanar’s Ireito (soul-consoling tower). This year’s inter-faith service did not include the traditional incense offering by the public.